France, 2011, 100 minutes, Black and white. Jean Dujardin, Berenice Bejo, John Goodman, James Cromwell, Penelope Ann Miller, Missi Pyle, Beth Grant, Ed Lauter, Joel Murray, Malcolm Mc Dowell. 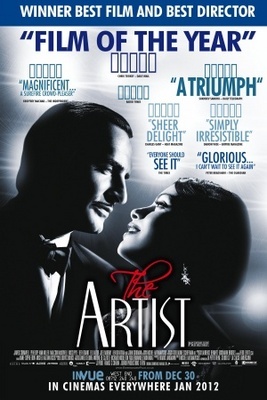 The surprise winner of the 2011 Oscar for Best Film as well as for Best Director, Score and the Best Actor, Jean Dujardin. And winner of a host of other awards around the world. The appeal? A film in black and white? Silent for words (except at the end) but not for sounds? A nostalgic memoir of the years in Hollywood for the transition from silent films to sound? A genial, if sometime despairing hero, a charming and bright leading lady? Success and failure? All of the above – and many more. Actually, the basic plot is not original. It is a variation on A Star is Born, where the actor’s career diminishes while his younger partner’s career takes off and flourishes. There is a great deal of enjoyment in the opening far-fetched 20s adventure on screen in one of those old picture palaces. Then the applause and the ego of the actor at the expense of the actress and the despair of the director. And all done, silently, in that theatrical miming style of performance. Jean Dujardin shines on the screen, even when he is being egotistical, when he is desperately filming another old-fashioned silent adventure, when he is caught up with the ingénue, Peppy Miller, and arguing with his wife, his director, even his loyal chauffeur. But, he is always genial with Uggie, the dog, who is also a scene stealer. Berenice Bejo (who is the director’s wife) shines on screen in every appearance, in her chance photo for Variety and her audition, her films (in the Clara Bow vein of the times), her singing and dancing. She also shines in her devotion to George Valentin and her care for him in his despair. So, arresting characters, a chance to look back at Hollywood of old and Hollywood in transition, the age-old stories of flops and successes – and, with zest at the end, of new beginnings. 1. The Oscar? Acclaim, awards? Ingenuity, cinema history, performance? 2. The putting on a show background? The 42nd Street type of film? The basic story – a reworking of A Star is Born? 3. The technical aspects of the film and their being enjoyable in the 21st century? The black and white photography and its style? The use of the silent film style, especially for comedy, melodrama, expressionism, the musical? 4. Silent movies, but the musical score and the moods? The sounds during the dream? The use of Pennies from Heaven? The final sound – and the artist’s final words? 5. The impact of silent films, the importance of stories, fantasy and imagination? The films of Georges Valentin? The performance and communication of character and themes without words? The captions? The danger of mugging? The change in acting styles with sound? 6. The change to sound, the 1920s? Audiences and their wanting to hear the performance, the actors and speaking techniques, for microphones and fluid sound – the mobility of the microphones on sets? 7. The opening film, the audience enjoying it, the style, the orchestra, the adventure style – exaggerated? The well-dressed audience and the crowds and their response? George and his deciding to make Tears of Love? The emotions, the audience, Peppy and her watching? 8. Careers and change, the silent stars and their collapse, the ridicule of their acting styles, of their voices? Audiences wanting the new and the young? 9. Peppy Miller, her verve, comedy, the light touch? Her scenes? The audiences laughing? The posters and their emphasis on her? Her chance encounter with George, the photo, the papers, her going to the auditions and succeeding? 10. George as a character, a blend of Douglas Fairbanks and Maurice Chevalier? The films and his action and derring-do? His assistant, the other members of the film-making team? The opening, his listening to the audience, the applause, coming out on stage, upstaging the actress and her anger? John Goodman as the director, trying to cope – and his performance, silent film style? 11. George at home, his relationship with Doris, tense? The theatres? Peppy, the wallet, the photo, the kiss, on the cover of Variety, George’s reaction, his becoming worse at home, Doris and her unhappiness, her leaving? His reaction to her departure? 12. Peppy and her being allowed into the studio, the Variety cover, the kiss, her identity, meeting Malcolm Mc Dowell as the old hand and discussion with him? The audition, her dance, her being hired? The casting director and his fascination? Dancing during the meal at the restaurant? George’s responding to Peppy, the attraction, affection? 13. The office meeting, the nature of the talkies, the director moving to talkies? George, his decision, going back, making Tears of Love, the scenes of film-making and the silent style? The release date discussion? Peppy, her debut, her success? The crash of the market? The few people for George’s film, Peppy and her friend, weeping? The contrast with the queues for her film? 14. George and his collapse, Doris’s departure, alone, trying to pawn his things, his gestures? Having to let everything go, the auction? The buying of all his items? The years passing, wandering, his friendship with his dog, Uggy? Uggy and his role in the films, on stage after the initial success, at home? His seeing Peppy and laughing? At home, watching his own films? Burning them? Uggy going to the police? George hospitalised? Peppy visiting him, taking him home? 15. George, the discovery of all his goods, that Peppy had bought everything at the auction? The issue of his career, his urging the director to allow him to act? Upset, going home, getting the gun, Uggy and his intervention? 16. Peppy, the driving, the crash, stopping, the reconciliation? 17. Clifton, the drive, Clifton and his fidelity, as chauffeur, as friend, the harshness of George firing him? Clifton and his signing the autographs for George’s photos? Willing to work without a salary? Going to Peppy, supporting her? 18. The happy ending, going to the studio, Peppy and George dancing together, the delight? The tribute to the musicals of those times?